The name says it all. This is one of his mom’s recipes, and no matter how many different brownie recipes I’ve tried over the years, Michael always asks for these. We’re talking real brownies—chewy, fudgy, with that slightly crackly top. Definitely not cake. And yes, they are very yummy. If you want to make a brownie sundae, they are delicious topped with ice cream and Irish Cream. WARNING: Do not make a full pan of these if you live alone. Invite people over to share them or take them to the office or give some away to your neighbors. If you want to spice up your chocolate a bit, check out the variations below using espresso powder, cinnamon, or even a pinch of cayenne. Many brownie recipes call for cocoa powder but do not specify which type to use—dutch process or natural unsweetened—and it used to leave me in a bit of a dilemma, that is until I found a very clear explanation on the differences between the two types of cocoa written by Stephanie at Joy of Baking, a resource that I turn to on a regular basis. The combination of the baking soda working with the acidic natural unsweetened cocoa powder produces the leavening action. Dutch-process cocoa is chemically non-reactive because it has been treated with an alkali to neutralize the natural acids. If you use the alkalized Dutch-process cocoa here, then there is no leavening action. So save the Dutch-process cocoa for baked goods that require baking powder. 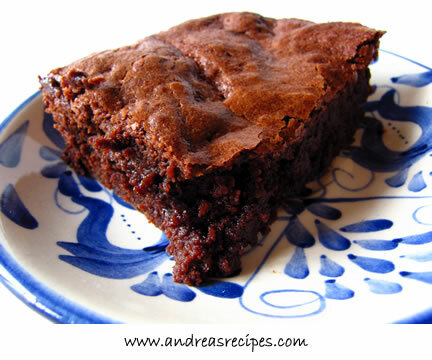 This is the best way to have brownies – I don’t like the cakey ones. Sounds like a fabulous recipe! I made these brownies yesterday and they were just what I was looking for in a brownie. Fudgy, soft, and the required crackly top my family loves. I added raisins, chocolate chips, and pecans. Served them with a scoop of frozen yogurt. A bit excessive?…YESSSS! These look wonderful. I’m keeping the recipe to try soon. I like the “print” feature you offer. Gosh – now I have to bake two chocolate goodies. My friends are gooing to “smell” them coming. Have postponed my trip to the grocery until I’ve checked all your recipes. My children like fudgy brownies. I’m learning how to bake. I try your receipe but did not turn out like yours. Mine is not fudgy. Why? What mistakes have I made? Please advise me. Thanks. Thanks Julie! Glad to hear there’s another fan of the brownies. I found this recipe after using your iced coffee concentrate recipe. These look AMAZING! However…I have a couple of questions. If I wanted to use some of the [coffee] concentrate in the recipe, how would I go about substituting? Could I use 1/4 cup of boiling water and a 1/4 cup of the concentrate, or would that be too much concentrate? Also, could I split the sugar with 1 cup of white and 1 cup of brown, or would it change the texture too much? Thanks in advance, can’t wait to try these.